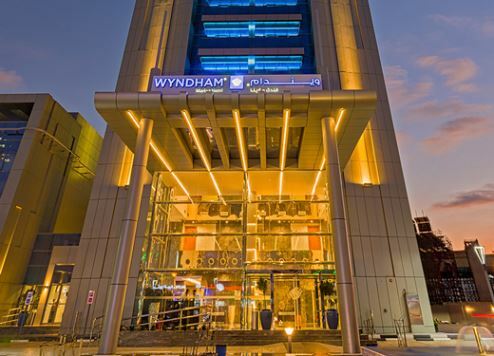 Wyndham Dubai Marina, a property developed by The First Group, has welcomed more than 36,000 guests during its first year in operation, management has confirmed. Since opening its doors on February 16, 2016, the hotel’s front- and back-of-house team has swelled to more than 205 associates representing 30 countries and continues to grow. During its first year in operation the hotel has launched four outlets, including the signature Range Bar & Grill, now renowned for its 1.2kg Tomahawk Steak. To mark 12 months of success, Wyndham Dubai Marina has planned a series of special events, room and dining promotions, and several competitions throughout the month of February 2017. The ‘Birthday Rooms Package’ is available to all guests celebrating their birthdays in February. They can book a three-night stay paying just AED1 ($0.272) for the first night. The package includes daily breakfast for two at Essence All Day Dining Restaurant, an automatic upgrade to a Grand Room, a birthday cake upon arrival, buy-one-get-one-free on 60-minute massage treatments at DreamWorks Spa located in the hotel, and a 20 percent discount at all restaurants in the hotel. Additionally, guests can take advantage of complimentary shuttle services to Jumeirah Beach Residence (JBR) and Mall of the Emirates. The ‘Birthday Rooms Package’ is valid for stays until February 25 and is priced at AED1 for the first night to commemorate the first birthday and approximately AED750 ($204) per night for the two succeeding nights. “We are proud to have successfully opened the first Wyndham Hotels and Resorts property in the UAE and for what we have achieved during such a short period of time,” said cluster general manager Rogier M. Hurkmans. Hotel guests and locals dining at Range Bar & Grill have the chance to win exciting prizes such as two return flights and a three-night stay at Wyndham Istanbul Old City, as well as a complimentary night’s stay and dining or spa vouchers at Wyndham Dubai Marina. The 486-key property is the first Wyndham Hotels and Resorts hotel in the UAE. It is owned by The First Group and is Wyndham's first hotel in Dubai, with three more in the pipeline.